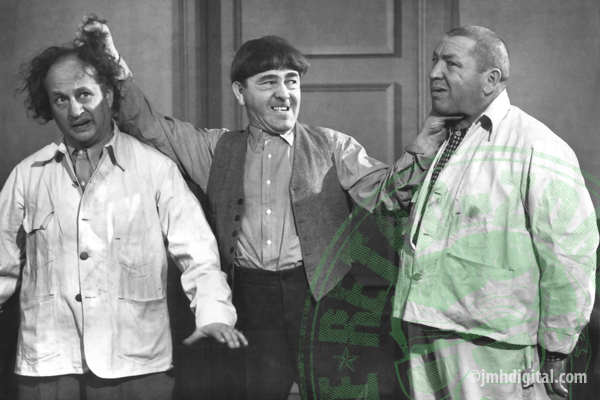 Being Retro: Why is it Women don't like the THREE STOOGES? Don't hate me, but I've never been a big fan either. I'm one of the very few women who liked them! Curly forever! The Three Stooges are great. A lot of people focus on the poking and slapping, but they got some really good visual gags and puns in. Sarah Walker would totally love them Jeremy. Curly is my favorite, but Larry is often overlooked. Wish me luck today, Jeremy -- THE BEAR WITH TWO SHADOWS has been released on audio today. What if Hibbs speaks, and no one cares to listen? That is scary!! I LOVE the Stooges, I always loved Moe, but had a soft spot for Larry. Poor guy! I loved watching the Stooges as a kid. They were hilarious. My mother was not so excited that I watched them so much. I always thought Larry was the guy who tried to keep things real but kept getting in between Moe and Curly/Shemp whenever things got heated.